A Balloon Heart. These were made and sold on Park Avenue by a cute, crafty couple. He sculpted the balloons and she sold them. $20-$30 each. 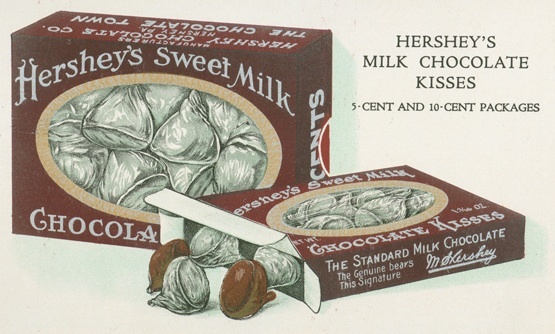 Hershey's Sweet Milk Chocolate Kisses from an 1920 advertisement. At the time, Kisses retailed for 1-cent for two (2) foil wrapped (by hand!) pieces. By 1921 a wrapping machine would wrap Kisses along with the paper plume bearing the Hershey's brand name. I started this Valentine post about Hershey Kisses but throughout the day was surprised by some the Valentine whimsy around me. First, walking down Broadway around lunchtime I saw a huge Kiss in the window of Paragon Sports. Then, on my way home I saw a couple making oversized balloon heart sculptures that to me were much cooler than a dozen roses. facebook.com/valentinesballoon. Hope you had a very sweet day!